← What Does God Think About Homosexuality? What Does The Bible Say? These are the Words of God coming out of the mouth of Jesus Christ. These words declare that Jesus and God are one in the same. Jesus very clearly tells us if we believe in God, we better believe in Jesus. Because, Jesus was God in the flesh, walking among us like He was one of us. This is the amazing truth of God’s word. It is also the only way to be saved, whether you like it or not. Jesus continues His discourse revealing great spiritual information to us. Jesus announces that where He came from was His “Father’s House”. A house is always a family structure with relatives and family members living within it. Now, think with me and see who is speaking, it is Jesus the Son of God on the earth. When you are a son on the earth do you live with your father forever? That is an interesting question. Here in the natural realm a man will marry a wife and usually establishes a new independent family and they normally do not live with their parents. What I am getting at, is that Jesus is inferring His Father’s house is not His house. The Bible contains some very complex truths in it and this is certainly one of them. It is definitely hard to understand since the Son of God on the earth is God. But, God’s intelligence is so far above our mind’s thought process that He can do some simple things in ways that are difficult for us to understand. What I want you to begin to understand is that Jesus does not call it His house and that is very important to see. You see Jesus is choosing His words very carefully and using extreme wisdom to reveal something that is far greater for us to know. 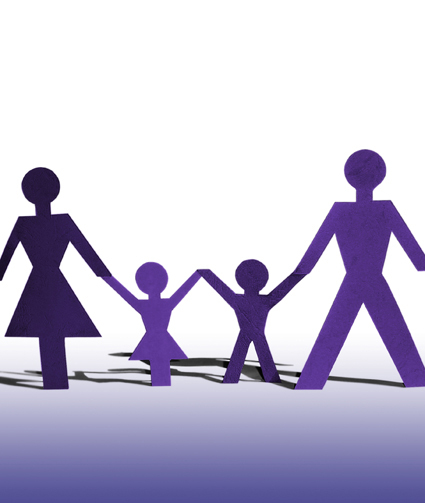 What we need to do today is to start thinking differently about the family of God. Jesus tells us that He came from His Father’s house from heaven and we now need to figure out what this is or I should say was. You see, in John 1:18 the Bible says no man has ever seen God. We also know that when Adam was created and his wife was brought to him by God, that God established a new family on the earth which was detached from God’s spiritual family in heaven. You see this truth when you study what God says in Genesis 2:24 “for this cause shall a man (Adam) leave his father and his mother and shall cleave to his wife”. From this statement we can understand that God was Adam’s father that we are told that he left to be joined to his wife. But God is establishing a new type for a future pattern for the Last Adam (Jesus) to come into the world and leave His Father and Mother and to be joined to His bride. Therefore, the family of Adam is a separate earthly family from God’s existing family in heaven that Jesus is speaking of where He came from and this is a prophetic view into an event that was to come after the time that Jesus was speaking these words in these verses in John. Therefore this family of God where Jesus came from was not comprised of any of the men or women that were on the earth. Think with me and make a note that Jesus declares God’s family consists of family members that are not men, so who are they? We will definitely explore this information in the Bible later in this series, but for now let’s continue with what Jesus is saying. Jesus says if it were not this way I would have told you. Then Jesus makes this statement, “I go to prepare a place for you!” Jesus is talking to you and I and He is saying that He was going to be leaving this planet soon and going to build a new household for His new family. To “prepare” has an implication of a building project. I believe that it is not just a renovation of the old, but the creation of a new home that will be better the previous one. Jesus continues to speak to us and tell us that where He goes we will also be going. Jesus tells us very clearly that He will soon return and “receive us unto Himself”. Have you ever thought about what those words mean? Why is Jesus receiving us unto Himself? So many Chrisdtians in the church like to call the church the body of Christ only. Then they ignore the rest of the Bible. If we were just the body of Christ, we would not need to be received unto Him, would we? I do not ever wake up in the morning and receive my body back to myself. Do you understand what I am saying? It would appear that Christians are now separate from Christ in order to be received by Him. It helps if you understand “Bible Covenants“. Since I have already done lessons on this subject I will not repeat the information here again. You should go back and read these lessons and learn what a Covenant is in the eyes of God. I will help you to some extent, Jesus is called the “Bridegroom” and He is in covenant with His Bride, the church. The church will soon be fully assembled in heaven for the marriage supper of the Lamb of God. During this time we will be fully and completely joined to Him and become one with Him forever. Jesus later tells us in John 14 that “He is the truth, the life, the way”. He also says that “No one comes to the Father except through Him”. Meaning there is no other religions in the world that will offer you salvation or an alternative way to God. That also means there are no other covenants of God that will save you either. God has sent Jesus Christ into the world to provide one way for all the people of earth to come into this new Family of God. We have already seen that God’s previous family structure was in heaven and had a very large location with many mansions in it, before Jesus ever came to the earth. Jesus then tells us that He was leaving the earth to go back to heaven to prepare places for us. So either God has a housing shortage in Heaven or the Heaven that we knew is going away and God is preparing a new place. Why is it necessary for God to build a new heaven and a new earth? I can understand the earth, but heaven is a tricky thing to consider to be something that is in need of repair. Man has done a pretty poor job of keeping the earth intact. But, come on we are talking about God in heaven now. Why is it necessary for God to create a New Heaven? Evidently, we can see that there was a major problem in heaven that also consisted of a heavenly spiritual war. Since we are discussing God’s spiritual family structure, I thought I would give you some more verses to establish that God has a family and then also describe the locations for this family. According to this verse written to the church God’s family is now in two different realms of reality. One is spiritual and the other is physical or natural. This verse in Ephesians declares God’s family to now be within the scope of both of these two sets of reality. We have one set that is found in heaven and one set that is on the earth. And God’s family is comprised of selected individuals from both of these places. However, do not attempt to be all inclusive and say that everyone in both realms has been saved and are in the unified family of God. That is what Universal Salvationists like to teach and project. They claim in error that God will save everyone eventually. They clearly do not understand that Jesus came to divide the good from the evil and not to change the evil back into the good. 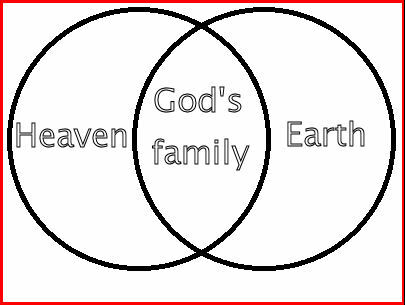 Here is a graphical representation of God’s new spiritual family. God’s family now consists of members of two different set realms. 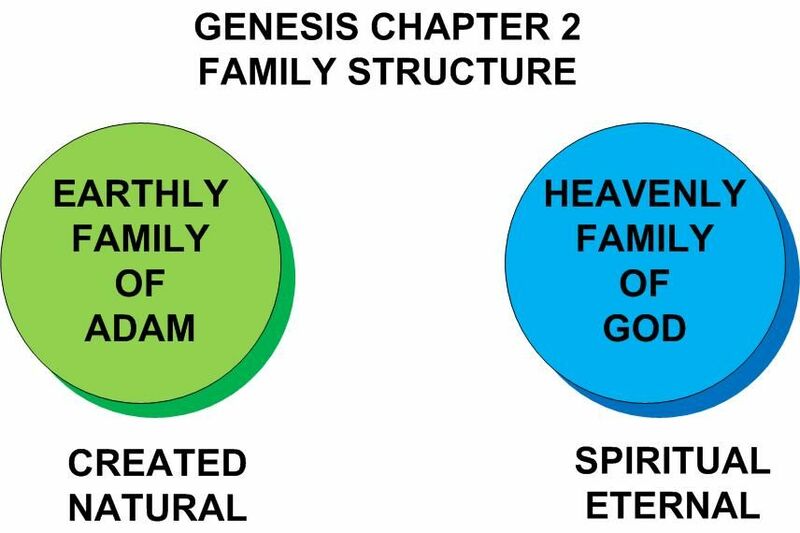 In the previous diagram I showed how the two families were separate in Genesis 2. The first set realm heaven existed prior to the other set realm created on the earth. The earth is the natural temporary realm where we all live today. God created our current world system approximately 6000 years ago and turned the authority of His creation over to His created man Adam (Gen 1:26). Adam represented a new start and a new natural family structure of God’s spiritual family. Adam’s family was separate from God’s family that already existed in heaven. God did all of this for many reasons and I cannot get into all of the reasons in this blog because it would take a tremendous amount of time to explain. Today, man exists within the constraints and limitations of time and space. We are spirit beings created in the image and likeness of God, but limited to the confines of a natural body. Since Adam’s family was separate from God’s family, that is one of the main reasons that Jesus had to come to the earth in the form of a man. God’s new family established by Jesus Christ the Son of God and the Son of Man, consists of selected members of both of these set realms. Jesus was able to accomplish and provide salvation for man because He was a man as well as a division from His father’s house simulataneously by His death on the cross. Let’s look at the definition of the word translated as “family” in Ephesians 3:15. This verse in Ephesians uses a word for “family” that is very interesting. You can see from the definition some widely applicable truths. God’s new family structure is a pattern of another previous structure that God did in the Old Testament. We are said to be a new nation of people descended from the Most High God. This is an interestingly different word that has a feminine connotation attached to it. Why would God put a female reference on the church? Because we are the bride of Christ. The church is a representative spiritual pattern of natural Israel. The natural nation of Israel was God’s wife in the Old Covenant. This was a pattern given to us for the New Covenant. You need to see what the Bible says and then interpret it using the Bible. God declares to the nation of Israel that I was your Husband. If God was the Husband to the nation of Israel that makes natural Israel the wife of God. A covenant is a marriage in the eyes of God. God proposed marriage to a nation of people and they accepted and entered into a covenant with the Almighty God. This is another example of God being a spiritual male in a spiritual family structure. We can clearly make many assumptions based upon this unlimited information. If God can marry one group of people, what stops God from marrying another group of people? Nothing really, except if you just marry a new group of people and you are still married to the other group of people you are now a polygamist by definition. There is a lot of men on earth that would like to think that God is married to multiple women, but you have not studied the Bible and therefore have put your thoughts into the mix where they do not belong. If the old covenant was a way to be saved then Jesus lied. The Old Covenant is not the New Covenant. We can clearly see that truth in verses like Hebrews 8:6 or Hebrews 12:24 when Jesus becomes the mediator of a new and better covenant. Any covenant called new is one that never existed before. All of this information that I am introducing you to will become clearer as the series continues and more scriptures are revealed to you. Many like to think that God is a polygamist and is in covenant with natural Israel and the church simultaneously right now. While they do not call it Polygamy, that is what God calls it. However, once you realize that the Old Covenant was with God the Father, and the New Covenant is with God the risen Son, I believe that changes everything dramatically. It also means that God is not in covenant with Natural Israel anymore. I do not have time or space to explain that, but you can read my other blogs and find more answers, if you want to know the truth. The natural nation of Israel is able to enter into the New Covenant with Jesus Christ, if they want to. However, most of natural Israel has chosen to close their eyes and not to see the truth, so they reap the works of their own deceptions. There is more I could write and many other scriptures that we could explore, but I have gone too long in this blog. Hopefully I can continue this subject in the future. If you would like to continue reading this series of lessons about the spriitual family of God you may continue with “Part 3“. Posted on May 26, 2010, in Bible Study, God's Spiritual Family, Understanding and tagged Bible, Bride, Christianity, Church, Covenants, God, Holy Spirit, Interpretation, Jesus, Prophecy, Religion, Revelation, Truth, understanding. Bookmark the permalink. 1 Comment.